I would like to see an actual Polearm made into production that's intended for that use. I've looking and found nothing. All able weapons are just taking out of the context of which there were made and substituted for a Polearm. If any of you have seen the dragon age two trailer you know what weapon im talking about, im talking about that kickass spear-sword the "main" character is using and using your naginata as sorts of inspiration ive thought of a way you can make it (The part of using already existent moulds to use something entirely new) you start off with a rather basic sword then onto that sword you place 1/3 of a staff and at the bottom of said staff you place a daggers blade, yes it will be something like the "staffs" from knights emerald however different as you would have different sized blades. The reason why i would want the dagger at the bottom end is that in my local larp community the pommels of calimacil weapons are considered too hard to use to hit someone with. Not firing ones!! A lot of larp players are using prop guns (as XVIIth century metal pistols) to add realism to their pirate or musketeer outfit. A full foam pistol or even musket with bayonet would allow people to actually fight with them as contondant weapons or piercing for the bayonet. There are a lot of XVIIIth century enthusiasts who would love to fight with muskets with bayonets. for an example: a shorter (or otherwise lighter) viking axe so you get more mobility if you are carrying a shield. As a former (and future) customer, I would like to share an idea / weapon request for you to think upon. A weapon designed around a historically existent model - The Athenry Mace. http://homepage.eircom.net/~foregan/adc/mace.html or just do your own search if links make you nervous. by nearly all LARP games. A product not offered by any other boffer weapon producer my extensive research can locate. Again, stressing the need for diversity. Specifically I'd like to see a Cinquedea added to the daggers, but the schianova, stilleto, and maybe some other rapier style weapons would be interesting. You guys have such talent, you should expand the diversity of your selection. For those who don't know a Shirasaya is a plain wooden Japanese blade mount consisting of a saya (scabbard) and tsuka (hilt), traditionally made of nurizaya wood. The Shirasaya can be seen in all of the Zatoichi movies as well as the 1989 Western, more mordern remake of Zatoichi vol 17, Blind Fury starring Rutger Hauer. 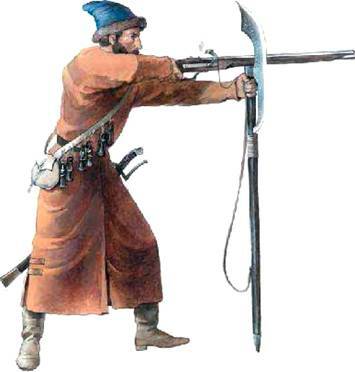 This long polaxe/glaive polearm was mainly used by russiand Strelitz soldiers (also as a rest for the musket) in the 17th century, but I think one would also be fi for several other charakter concepts eg. Barbarians. I have noticed that some of of your swords have great videos. I suggest that try to make videos for more swords because they are great for showing the lengths and proportions compared to real people. I'm think of a mace, war hammer and zweihander(aka two handssword) some great that it out match "Odo the mace". The look in my head is something like a late medieval/renassance mace. And the war hammer out matching "Scrow The War Hammer", a more real life looking war hammer, from the late medieval/renassance. And 'bout that zweihander... I'm thinking of a Warhammer greatsword, cause who wouldn't have a sword like that, eh?? ?